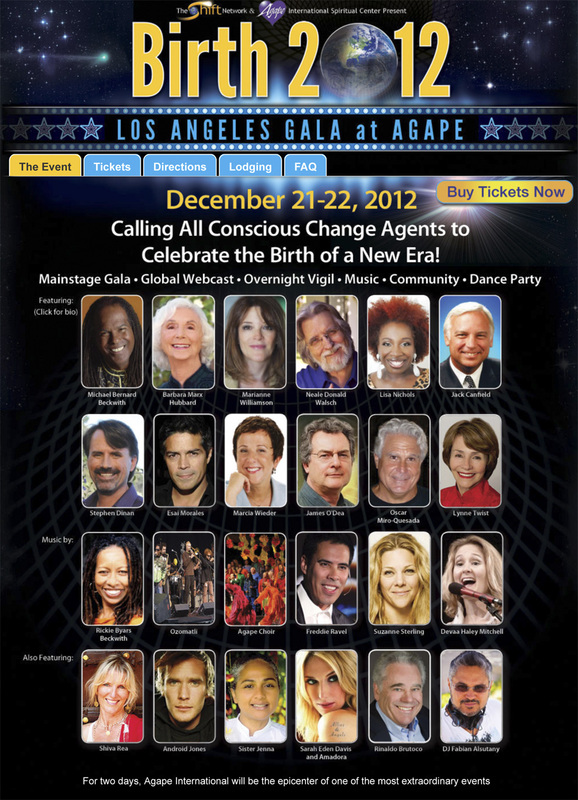 Calling All Conscious Change Agents to Celebrate the Birth of a New Era! Featuring: Michael Bernard Beckwith, Barbara Marx Hubbard, Marianne Williamson, Neale Donald Walsch, and many more! To buy tickets or watch the Global Webcast, visit www.Birth2012.com. For two days, Agape International will be the epicenter of one of the most extraordinary events ever – a global movement to birth a new era! Our goal is to unify 100 million people worldwide. The world’s top transformational leaders are coming together with musicians, artists, ceremonialists, and performers in 40+ major events and hundreds of smaller events worldwide that will be featured over a 33-hour global livecast. The event at Los Angeles’ Agape will be Ground Zero for this event as host to Birth Day Ceremony, live music, interviews, global synchronizations and more. The apex of the two days will be a live Gala Ceremony and Celebration from 11:30 am to 3:30 pm on Saturday, which will be broadcast globally and feature transformational leaders and artists in an unforgettable production with music, inspired talks, visioning, awards, global sing-alongs, ceremony, and celebration. Imagine a spiritual version of the Oscars – sacred, inspiring, and profound! (Fri., Dec. 21, 3:00 am – Sat., Dec. 22, 9:00 pm) – the 33-hour live Global Webcast kicks off at noon Friday from Agape’s Sanctuary and will feature events from around the world, including Australia, Mexico’s pyramids, Egypt, Thailand, Israel, New York, India, and dozens more PLUS global meditations and synchronizations. You’ll be able to watch highlights of this program on the Agape big screens during the Gateway program Friday and all Saturday, including messages from indigenous elders as well as pioneers such as don Miguel Ruiz and Ram Dass. For more on the schedule as it finalizes, visit www.birth2012.com. Please note that all of the following events are general admission. There is no reserved seating in the Agape Sanctuary. (Fri, Dec. 21, 12:00 noon – Sat., Dec. 22, 1:00 am) – This 13-hour vigil is an Agape special event that has been integrated with the Birth 2012 Gala. Agape is offering it on a love-donation basis, but Global Pass-holders secure guaranteed admission along with a Gift Bag (detailed below). The event will feature music, meditation, prayer, movement and joyful celebration at Agape with Michael and Rickie Beckwith, Naam yoga founder Dr. Joseph Levry, and many musical artists, culminating in a full concert from 9:00 pm to midnight. During the Gateway event, we’ll have globally synchronized waves of unity every two hours, from One Billion Oms centered in India to Qigong to Havdalah from Jerusalem to drumming from Mexico to a Unity prayer. (Sat., December 22, 11:30 am – 3:30 pm) – Join today’s top transformational leaders, artists, and visionaries and surprise musical guests for an unprecedented gathering that culminates hundreds of events worldwide: it’s the global Golden Moment, with millions joining their prayers and blessings worldwide to mark this beautiful transition. Be ready for extraordinary inspiration from Barbara Marx Hubbard, Michael Bernard Beckwith Neale Donald Walsch, Marianne Williamson, Stephen Dinan, Jack Canfield, Lisa Nichols and music from Rickie Byers Beckwith, Ozomatli, Freddi Ravel, the Agape Choir, and surprise musical guests! We’ll also be giving Shift Awards to Innovators in peace, sustainability, wellness, and economics. (Sat, Dec. 22, 9:00 pm – 1:00 am) – Groove into the new era with Shiva Rea’s Yoga Trance Dance Android Jones performance art, and live music from Suzanne Sterling, Devaa Haley Mitchell, and Sarah Eden Davis plus her band Amadora, inspiration from Birth 2012 Producer Stephen Dinan and Rev. Arlene Campbell, and dance-a-licious grooves from DJ Fabian Alsutany at a venue right next door to Agape.